The main sight on the island of Møn is Møn's Klint, 5 000-year-old chalk cliffs which drop more than hunderd meters into the sea and are a major tourist attraction for Danes and foreigners alike. It's presumably also the only spot in Denmark with a falling rock sign. But that was no impediment for our man in the field. I'll tell you: what our spotters can't dig up is not there. 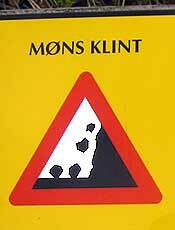 We knew already that Denmark and the Faeroe Islands carry the same line of Men-at-Work and Children's signs and the similarity of the Falling Rock signs is therefore hardly a surprise. the sign is Danish design and was brought to the Faeroes. 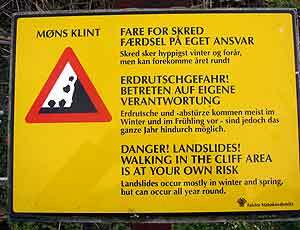 Or the sign was born on the Faeroes and then traveled to Denmark as well as to Iceland. Noticed that the boulders landed on their tip and managed to stay upright?